What do you do once you've decided to buy a downtown Vegas casino and re-brand it with a Detroit theme? 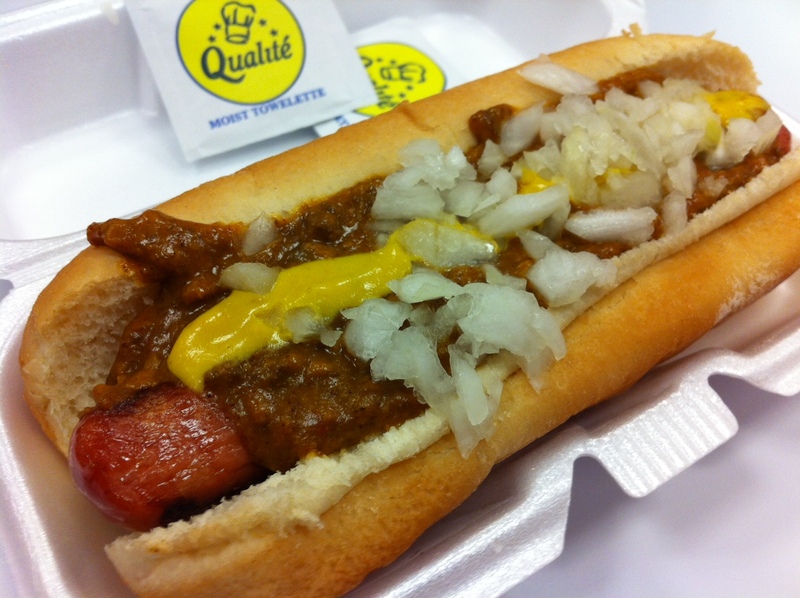 Bring in a Detroit hot dog joint, of course. IT'S CALLED LOCAL FLAVOR GET IT. Whatever. This is the standard dog from American Coney Island in The D. It's a Dearborn Sausage brand dog (from Michigan) in a natural casing, complete with that strange-but-pleasant snap with each bite, and as you can see, it's a bit overcooked, into a wrinkly little puppy. It's supposed to be served in a warm steamed bun with chili sauce, mustard and chopped sweet onions. Unfortunately, the bun was cold, and really, this is maybe the most important thing with hot dogs. Spectacular bread can always cover for subpar sandwich fillings, and a moist, warm bun would have made this a winner. But it was cold. And dry. The chili sauce was fine, well-spiced and guilt-inducing, but the onions were not sweet. Try bitter. Fremont Street is in need of great walk-by-and-bite options, but American Coney, sadly, fails to fill that seemingly simple niche.